Sophie's Gourmet Pierogiis a new food truck specializing in the famous Polish dumpling accented with international flavor. It makes regular appearances at the Columbus Commons Food Truck Food Court, Dinin' Hall and other spots around central Ohio. Sophie's prepares all of its pierogi in butter, so vegans are out of luck except for salads. The staff capably answered all vegetarian questions, and prepared a fresh order of veggies as a side after I asked questions about vegetarian items. The Vintage is an order of potato and cheese pierogi served with sauteed onions, sour cream and compound butter. The pierogi are boiled and then pan fried golden and delicately crispy. It is an excellent example of a traditional pierogi. The only two minor issues were that the compound butter was a little cold and difficult to incorporate into the dish, and the number of pierogi varied in three different orders. The summer salad was cucumbers, tomatoes and red onions in a vinaigrette topped with crumbled Asiago cheese. It was only available at my first visit to the truck. The crew actually does a great job handling large crowds. 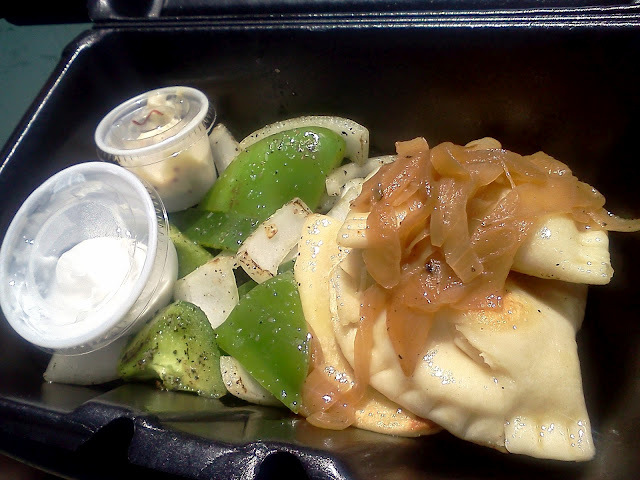 There is a hot serving bar in the truck window, allowing pierogi to be churned out rapid-fire to waiting diners. At slower stretches, pierogi are prepared to order.